People look at a street collapsed by the Tiribi river flooded by heavy rains from Tropical Storm Nate in San Jose, Costa Rica October 5, 2017. SAN JOSE - Tropical Storm Nate killed at least 22 people in Central America on Thursday as it pummeled the region with heavy rain while heading toward Mexico’s Caribbean resorts and the U.S. Gulf Coast where it could strike as a hurricane this weekend. 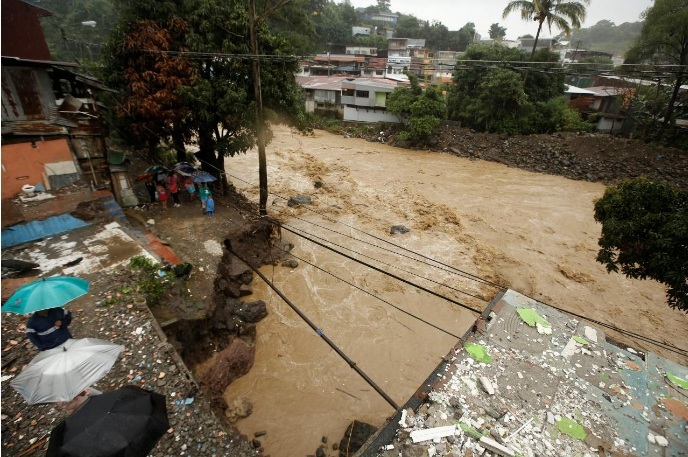 Emergency officials in Costa Rica reported that at least eight people were killed due to the lashing rain, including two children. Another 17 people were missing, while more than 7,000 had to take refuge from Nate in shelters, authorities said. Highways in the country were closed due to mudslides and power outages were also reported in parts of country, where authorities deployed more than 3,500 police. The Miami-based National Hurricane Center (NHC) said Nate could produce as much as 20 inches (51 cm) in some areas of Nicaragua, where schools were also closed. At about 8 p.m. EDT (0100 GMT) Nate was some 45 miles (72 km) west of the Honduran town of Puerto Lempira, moving north-northwest at 10 mph (16 kph), the NHC said. Blowing maximum sustained winds of 40 mph (64 kph), Nate was expected to move across eastern Honduras on Thursday and enter the northwestern Caribbean Sea through the night. The storm will be near hurricane intensity when it approaches Mexico’s Yucatan Peninsula late on Friday, where up to 8 inches (20 cm) of rain were possible, the NHC said. U.S. officials from Florida to Texas told residents on Thursday to prepare for the storm. A state of emergency was declared for 29 Florida counties and the city of New Orleans. Muslim Global: Tropical Storm Nate kills 22 in Central America, heads for U.S. Tropical Storm Nate killed at least 22 people in Central America on Thursday as it pummeled the region with heavy rain while heading toward Mexico’s Caribbean resorts and the U.S. Gulf Coast where it could strike as a hurricane this weekend.